NASA has released a stunning image of Jupiter's southern hemisphere taken by the agency's Juno spacecraft. 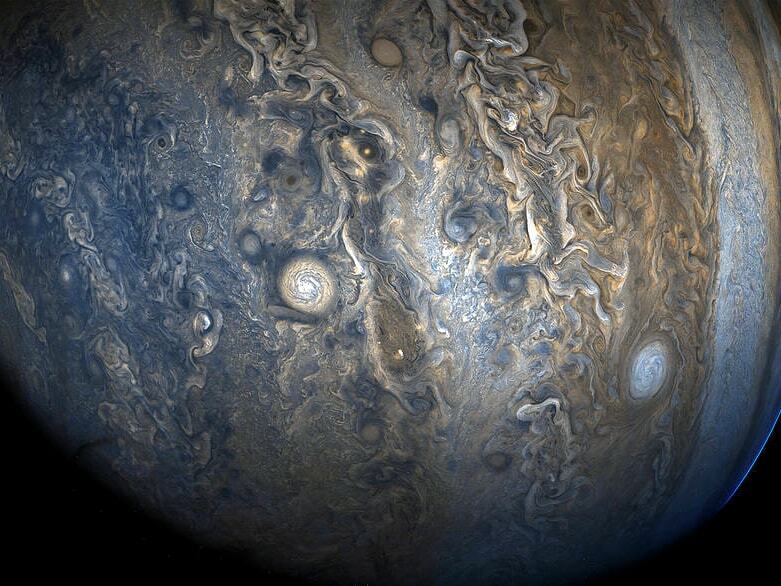 The colour-enhanced view captures one of the white ovals in the "String of Pearls," one of eight massive rotating storms at 40 degrees south latitude on the gas giant planet, NASA said. The image was taken on 24 October, as Juno performed its ninth close flyby of Jupiter. At the time the image was taken, the spacecraft was 33,115 kilometres from the tops of the clouds of the planet at a latitude of minus 52.96 degrees. Launched on 5 August, 2011, from Cape Canaveral, Florida, Juno arrived in orbit around Jupiter on 4 July, 2016. During its mission of exploration, Juno soars low over the planet's cloud tops. During these flybys, Juno is probing beneath the obscuring cloud cover of Jupiter and studying its auroras to learn more about the planet's origins, structure, atmosphere and magnetosphere.